Root barrier is a rigid plastic sheet made from high density polyethylene. The Root barrier is simply placed vertically into a trench of varying depth to provide a barrier impenetrable by tree roots. 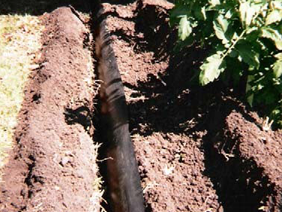 The Root barrier should be installed adjacent to building footings or directly under the “drip line” of the tree to ensure that roots cannot propagate and potentially damage hardscapes such as concrete and paved pathways. Root barrier is available in depths of 600mm, 900mm and 1200mm.